A great way to offset some of the colors you already have throughout your landscape is to install the right fence around your property. Are you looking to improve the appearance of your home and landscape in 2019? Does your property have a fence around it? 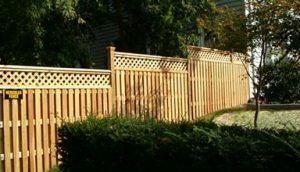 A new fence could be exactly what your yard needs! There are several benefits of having a fence around your property. They an excellent security measure and can provide your home and yard with some much-needed privacy. Fences can also be a great way to add some curb appeal to your home. Keep reading and discover why this is the case and why you should consider investing in one for your property this year. Do you want to add a splash of color to your landscape? Most people will turn to plantlife when they want to add some vibrant colors to their property. Many homeowners forget that a new fence could be a great way to incorporate color into your yard. For instance, a bright white picket fence can rejuvenate your landscape by brightening it up a bit! In order to have a beautifully landscaped property, you need to have a few contrasts in color. A great way to offset some of the colors you already have throughout your landscape is to install the right fence around your property. It could serve as the perfect backdrop of color for your landscape. A new fence is an excellent way to add character to your home. For example, a traditional wood can provide a rustic or classic look to a property. Another option would be to install a wrought iron fence to give your landscape a more elegant or ornate appearance. There are tons of fencing options available today. Consider the various options and you will surely find one that enhances your curb appeal! This entry was posted on Friday, January 18th, 2019 at 11:50 am. Both comments and pings are currently closed.